Whiskies of the Week: Orphan Barrel Whiskey Distilling Co. 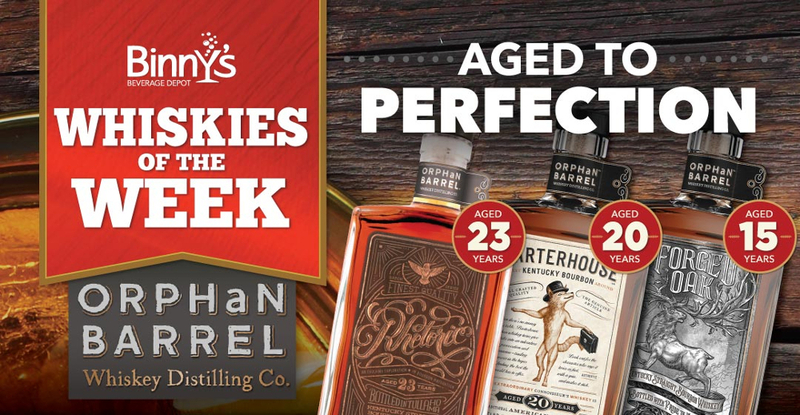 Tags: whiskies of the week, whiskey hotline, orphan barrel whiskey distilling co.
As more releases from the Orphan Barrel line of bourbons keep coming, their consistent value pricing continues to surprise us. In all honesty, the prices of theses bourbons are surprisingly low considering the age of the barrels and current demand for mature bourbons. Finding this much juice at such an advanced age really is an oddity in this boom portion of the space-time bourbon continuum. As with the previous releases, grab them while you can. They will most certainly disappear at a quick pace. This highly sought after 4th release in the Rhetoric line is a wonderful example of extra mature bourbon. Toasted oak and buttered grain lead the way on the nose with soft fruit, toffee, caramel, vanilla, and spice in the background. On the palate, anise and dark cocoa lead with red fruits, vanilla, clove, leather and grain close behind. The finish lingers with fruit and drying spice lingering. Distilled from a mash of 86% corn, 8% barley, and 6% rye. One of the more easily drinkable 20 year old bourbons that you will find. Also, one of the more affordable. On the nose, this bourbon leads with buttered grain, toffee, vanilla, and soft red fruit. On the palate, dark red fruits are complemented nicely with brown sugar, dark cocoa, vanilla, and clove. On the finish soft spice and fruit linger alongside browned butter and anise. Dangerously drinkable and in short supply. Grab them while you can. 10 years is typically the oldest bourbon youll find on the shelf. With an extra 5 years, this Orphan Barrel begins to dip deeper into the elite world of extra mature bourbon. On the nose, oak spice and candied orange segments with dark red fruits. On the palate, charred oak and spice lead the way while candied citrus, dark red cherries, toffee, and clove follow. The finish is rather dry with pepper and spice dominating. Soft undertones of candied orange and clove linger. The standard retail scale for bourbon leans towards $10 per year. Finding a 15 year old Bourbon for $70 is quite a steal. Check out the Whiskey Hotline for updates on new whiskey, tastings, sales and more!